Every year, my mom makes batches and batches of different kinds of Christmas cookies to bring to her co-workers, family, and friends. Making sugar cookies is a Christmas memory that goes back as far as I can remember, which includes stealing the dough when my mom wasn’t looking, fighting with my sisters over who got to roll it out, and getting so frustrated when the leg broke off my reindeer. If everything always went perfect, life wouldn’t be any fun, right? 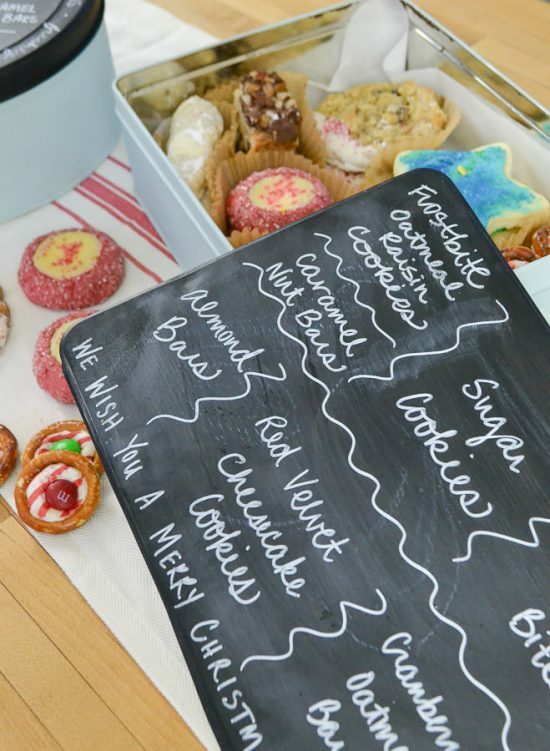 I’ve continued the tradition of baking Christmas cookies to give to loved ones and enjoy planning out the different types I’ll bake and give each year. 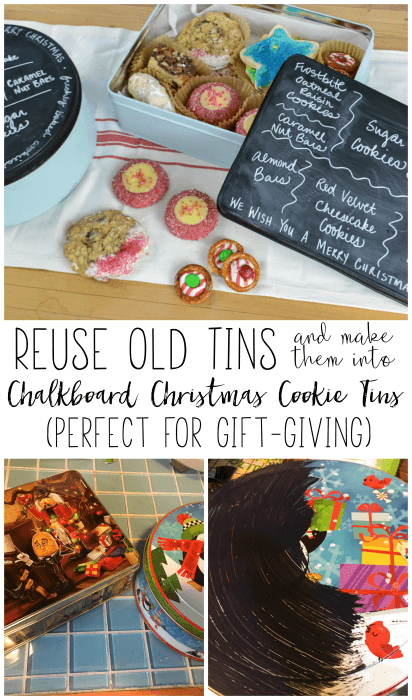 For many years, I’d always purchase new tins from the craft store to give the cookies in. Then, I started seeing those same tins at the thrift store. Were they the exact ones I gave to friends and family? Who knows, but it got me thinking about how wasteful it was to purchase new ones every year, especially if others don’t actually want to keep them anyway. Last year, I did things a little differently. Instead of going to the craft store, I went to the thrift store and purchased some old tins. As you can probably guess, the patterns were not the best, and some of them had nothing to do with Christmas whatsoever. 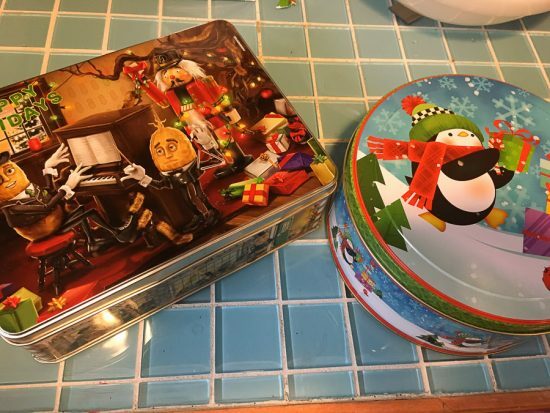 I decided to transform those uglies into a functional cookie tin, that I hope the recipient might be able to find another use for in their home. This post contain affiliate links. You can read my full disclosure policy here. I painted the base of the tins with two coats of chalk paint. 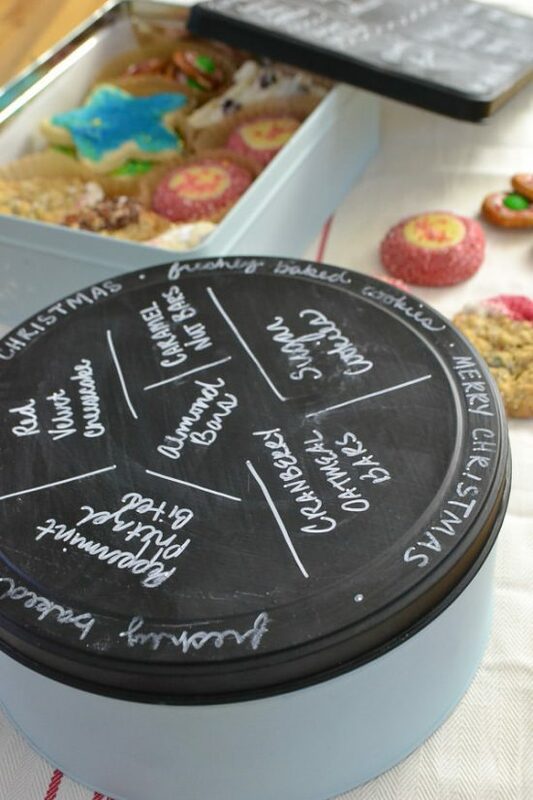 I’d recommend using chalk paint, because it sticks to everything, even the slippery metal surface of a tin container. 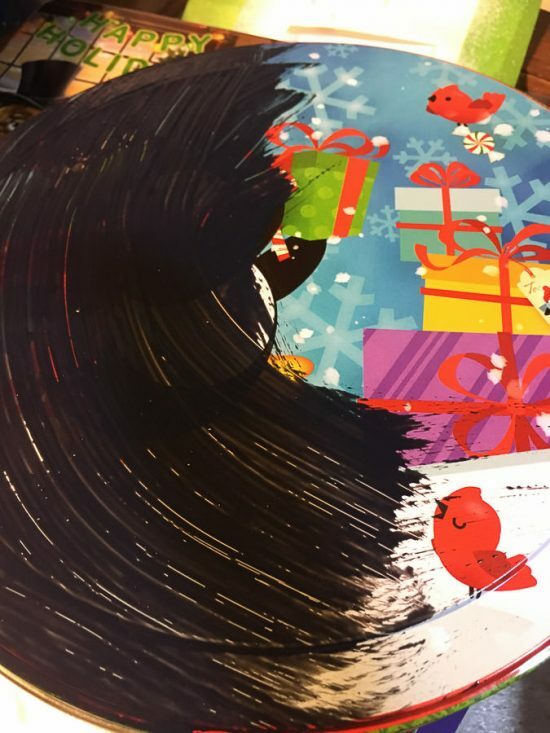 I also decided to paint some little snowflakes on the outside of the bottom of the tin with a paint marker, but obviously you could design it however you’d like. I painted the lid of the tin, but this time with chalkboard paint. Three coats of this paint should do the trick. 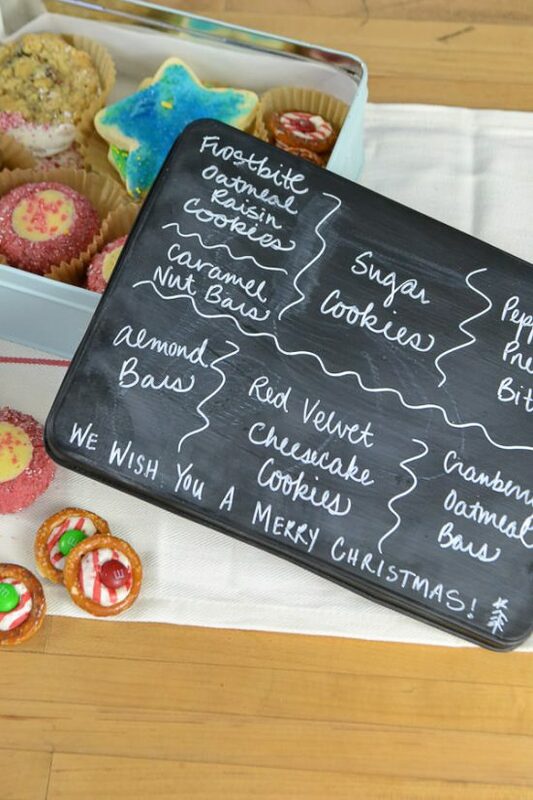 After everything has dried, use a piece of chalk turned on the side to “season” the chalkboard lid by rubbing in back and forth horizontally, then vertically. Erase the chalk, and then write on the surface. I decided to label the types of cookies in the tin, based on where they were placed inside. You know, just like how Fannie May and Jelly Bellys give you the varieties on the inside of the lid so you know just what you’re eating? That is, unless you’re like me, and always have trouble figuring out which way the box lid should actually be turned to match the chocolates. 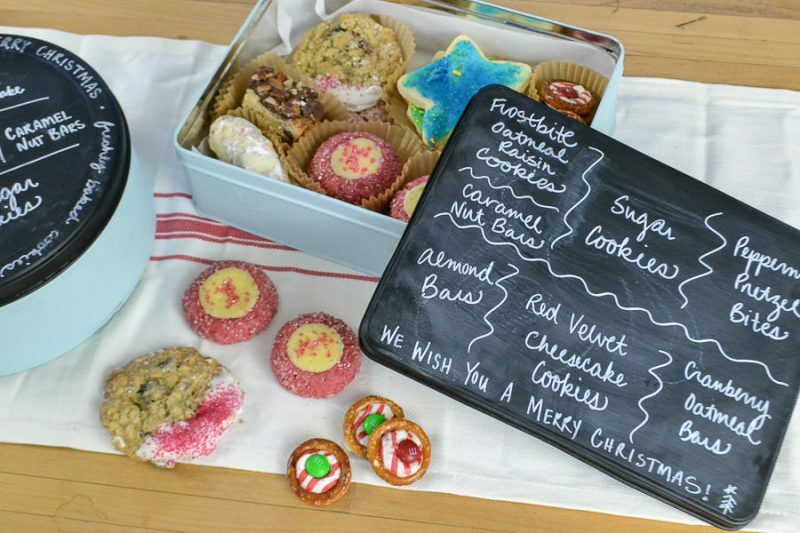 After eating all the cookies, I hope my friends and family will erase the chalk labels, and then use this tin for another purpose!